Due to the fact that chemical nematicides frequently cause environmental pollution and toxic hazards to human, plants, and domestic animals, certain biocontrol agents of environmentally and toxicologically safe properties and secure to human and animals were tested against root-knot nematode Meloidogyne incognita on cowpea. The protective effect of two isolates of Bacillus subtilis, B. pumilus, or Pseudomonas fluorescens on M. incognita reproductive parameters infecting cowpea was examined, and consequently, plant growth and yield parameters were investigated. The nematicide, Furadan (10% G) was, also, included in this study for comparison. Bacillus subtilis (Bs2) recorded the highest average total percentage reduction (82%) of M. incognita reproductive parameters followed by B. pumilus Bp2 (81.8%). Also, Carbofuran 10% recorded the highest average total percentage reduction (76.5%) in terms of numbers of second-stage juveniles (J2) in plant roots and soil as well as nematode galls and eggmasses compared to the untreated check. The highest total average percentage plant growth increase (99%) was obtained by B. pumilus (Bp1), but B. subtilis (Bs2) and medium recorded 26.3 and 12.8% only, respectively. P. fluorescens (Pf1) scored the highest yield increase (97%) followed by Pf2 (63.8%). Number of bacterial nodules showed the highest percentage increase (78%) by P. fluorescens (Pf2). B. pumilus (Bp1) caused the highest increase of phenolic compound contents followed by P. fluorescens (Pf1). The nematicide Carbofuran 10% G was the first in increasing soluble protein contents followed by P. fluorescens (Pf1). Bacillus pumilus (Bp1) caused the highest total contents of photosynthetic pigments followed by P. fluorescens (Pf1) and (Pf2). The tested biocontrol agents could achieve various degrees of M. incognita control on cowpea under screen house conditions with consequent increase in cowpea growth and yield parameters. These bacterial isolates need to be studied under different field conditions for confirmation. The serious impact of phytonematodes on agriculture economy has recently been documented, especially for developing countries like Egypt (Abd-Elgawad and Askary 2015). Yet, due to the fact that chemical nematicides frequently cause environmental pollution, pest resistance, and toxic hazards to human, plants, and domestic animals, certain bioagents of environmentally and toxicologically safe properties and secure to humans and animals were tested. Osman et al. (2011) showed that Pseudomonas fluorescens reduced root knot parameters when treated as soil drench at S/2 dilution (108 CFU/ml/2). In another study, Bacillus subtilis and B. thuringiensis inhibited populations of root-knot nematode Meloidogyne incognita on tomato plants in the soil with 82.6 and 80.5% reduction, respectively (Khalil et al. 2012). Akhtar et al. (2012) showed that the rate of M. incognita on Vigna mungo was significantly reduced by P. fluorescens and B. subtilis. This reduction was reflected by increasing plant growth parameters as indicated by certain plant growth criteria and number of bacterial nodules per plant compared to the untreated control. Also, P. fluorescens and B. subtilis inhibited the number of galls by 42.79 galls per plant. Out of numerous plant growth-promoting rhizobacteria (PGPR) genera, Bacillus spp. have a considerable effect as biocontrol agents on plant-parasitic nematodes (PPNs) and on root colonization, multiple modes of action, and promising ability to sporulate under stressed conditions (Kavitha et al. 2012). Nematophagous bacteria as biocontrol agents of PPNs were recently reviewed (Eissa and Abd-Elgawad 2015). Abd-El-Khair et al. (2016) showed that eight selected isolates of Bacillus spp. reduced certain nematode criteria and improved plant growth compared to untreated check. Recently, Abd-Elgawad and Askary (2018) listed fungal and bacterial nematicides with their comprehensive references and relevant information, i.e., the active ingredient, product name, type of formulation, producer, targeted nematode species and crop, and country of origin. Sohrabi et al. (2018) showed that four species of PGPR of which P. fluorescens and B. subtilis inoculated in the presence or absence of root knot nematode significantly improved the tomato growth parameters. Also, the reproductive factor of Meloidogyne javanica was significantly affected by P. fluorescens and B. subtilis as it reduced from 112.15 to 24.94 and 24.96, respectively. The purpose of this research is to investigate the nematicidal activity of two isolates of each of Bacillus subtilis, B. pumilus, and Pseudomonas fluorescens, on Meloidogyne incognita reproductive parameters and consequent plant growth and yield of cowpea under screen house conditions. Furadan (Carbofuran 10% G), a widely used chemical pesticide for its strong effect on PPNs and insect pests as a systemic nematicide and insecticide in Egypt (e.g., Abd-Elgawad and Kabeil 2010) and elsewhere (e.g., Faruk et al. 2012), was included for comparison with the bacteria tested herein. Pure culture of M. incognita was propagated on eggplant from stock of the nematode species. Newly hatched second-stage juveniles (J2) from this culture were used as inoculum. Perineal patterns of adult females from eggplant roots were used to confirm the nematode species (Taylor and Sasser 1978). Six bacterial bio-control isolates viz. Bacillus subtilis (Bs1 and Bs2), B. pumilus (Bp1 and Bp2), and Pseudomonas fluorescens (Pf1 and Pf2) were isolated from dry bean plant rhizospheres in Giza Governorate, Egypt. The bacteria were identified by morphological, cultural, and biochemical characters, using standard bacteriological methods, in the Department of Plant Pathology, National Research Centre, according to the methods described by Goszczynska et al. (2000). For inoculum preparation of these bacteria, they were separately inoculated in nutrient sucrose (2%) broth medium (beef extract 3 g, peptone 5 g, glucose 10 g) in 1 l of distilled water, and pH was adjusted at 7.4 ± 0.2. The bacterial cultures were incubated at 28 °C for 48 h. Then, the bacterial inocula were adjusted to 107–109 colony forming unit (CFU)/ml by turbidity method (Baid et al. 2000). Bacterial inocula were used as a mixture of bacterial cells and cultural filtrate (Abd-El-Khair and Haggag 2007). The experiment was conducted at screen house of Plant Pathology Department, National Research Centre (NRC), Giza, Egypt. Four of cowpea seeds were sown in plastic pots (20-cm diameter) containing 2 kg of solarized sandy-loam soil. Then, plants were thinned to two plants per pot. Each pot was inoculated with 1000 newly hatched J2 of M. incognita (in four holes made around a plant). At the same time of nematode inoculation, cowpea plants were treated with each bio-agent inoculum via four holes around the plant. These treatments were compared with a nematicide, Furadan (Carbofuran 10% G), at the rate of 0.02 g/pot (equivalent to 10 kg/Feddan (Feddan = 4200 m2) and medium. Four pots were used as replicates in each treatment. All pots were inoculated with Al-aukadin (containing nitrogen-fixing bacterium, namely, Bradyrhizobium spp. The pots were arranged in a completely randomized design on a bench under screen house conditions maintained at 25 ± 5 °C; the plants were irrigated as needed. After 3 months of nematode inoculation (Harvest stage of cowpea), roots of cowpea were carefully uprooted and washed thoroughly with running tap water to avoid hanging soil particles and then hatched numbers of J2 in eggmasses were extracted by an incubation method (Young 1954) in one half of roots. Parameters of M. incognita reproduction in terms of numbers of second-stage juveniles (J2) in plant roots and soil per pot as well as nematode galls and eggmasses per plant in another half of roots were recorded. For soil extraction of nematodes, a sieving and decanting technique (Barker 1985) was used. The nematodes were counted using a light microscope. Effects of the bacterial bioagents on vegetative parameters of cowpea, shoot length (cm), fresh and dry shoot weights, and fresh root weight (g) were recorded after 3 months of nematode inoculation. Also, the number as well as fresh and dry weights of pods and weight of 100 seeds were estimated. The method of Danil and George (1972) was used to determine total phenolic compounds from seeds colorimetrically by a Folin Ciocalteu phenol reagent. The determination of soluble protein was carried out by the method of Bradford (1976). Photosynthetic pigments (chlorophyll A, chlorophyll B, and carotenoids) in the fresh leaves were determined as described by Moran (1982). Analysis of variance (ANOVA) procedures of the obtained data were performed through Computer Statistical Package (COSTAT) User Manual Version 3.03, Barkley Co., a computer-based program. To separate the means among treatments at 5% level of probability, Duncan’s multiple range test (DMRT) was applied (Snedecor and Cochran 1999). Results in Table 1 illustrate the significant (P ≤ 0.05) effect of the tested bacterial isolates in controlling M. incognita on cowpea. Average total percentage nematode reduction was calculated to further determine the differences among treatments. It was observed that the highest average percentage total nematode reduction was achieved by using B. subtilis Bs2 (82%) followed by B. pumilus Bp2 (81.8%) compared to the untreated check. The two isolates of P. fluorescens Pf1 and Pf2 showed intermediate reduction (69.8 and 62.3%), respectively. Carbofuran 10% recorded higher reduction (76.5%). The least nematode reduction (61.5%) occurred by medium only. Results in Table 2 indicate the significant (P ≤ 0.05) effect of the tested bacterial isolates on cowpea growth criteria as influenced by M. incognita when compared to untreated check. It was observed that the highest percentage increase as a total average in plant growth criteria (99%) was achieved by using B. pumilus (Bp1) followed by 86.8% achieved by B. pumilus (Bp2) and 57.5% occurred by the nematicide. The lowest average total percentage increase (26.3%) occurred by B. subtilis (Bs2) and medium only (12.8%). Other isolates differed in their effect on plant growth criteria. Table 3 illustrates the nematicidal significant (P ≤ 0.05) effect of the tested bacterial species and isolates on the yield parameters and number of bacterial nodules of cowpea as influenced by root-knot nematode infection. It was observed that the highest average total percentage yield increase (97%) was achieved by using P. fluorescens (Pf1) followed by P. fluorescens Pf2 (63.8%). The least average total percentage yield increase was recorded by B. subtilis Bs2 (41.3%) followed by medium only (14%). The number of bacterial nodules increased at the different treatments being the highest percentage by P. fluorescens Pf2 (78%) followed by B. pumilus Bp1 (44%). The least increase (15%) occurred by using B. subtilis (Bs1). It is clearly noticed that phenolic compounds and soluble proteins significantly (P ≤ 0.05) increased as they are affected by the different treatments compared to those of the untreated check (Table 4). B. pumilus (Bp1) was the first in increasing phenolic compound contents followed by P. fluorescens (Pf1) followed by Pf1 compared to the other treatments and untreated check. As for soluble proteins, the nematicide Carbofuran was the first in increasing soluble protein contents followed by P. fluorescens (Pf1) comparable to the other treatments and untreated check. Also, results in Table 4 illustrate the effect of the different treatments of the tested bioagents on chorophyll A, chlorophyll B, and carotenoid contents. It is well noticed that the contents of photosynthetic pigments were significantly (P ≤ 0.05) increased by different treatments compared to the untreated check. B. pumilus (Bp1) recorded the highest total contents of photosynthetic pigments followed by P. fluorescens (Pf1) and medium only. The least one occurred by untreated check. The present results showed that the two isolates from each of B. subtilis, B. pumilus, and P. fluorescens had nematicidal activities against M. incognita as well as enhancement of the growth, yield parameters and number of bacterial nodules of cowpea. B. subtilis Bs2 followed by B. pumilus Bp2 recorded 82% and 81.8% as average total percentage nematode reduction, respectively compared to the untreated check followed by P. fluorescens. The reduction in nematode numbers may be due to the tested rhizobacteria found in the plant rhizosphere which could possibly cause different modes of action against plant parasitic nematodes including producing antibiotics, enzymes, and toxins. They can parasitize and promote systemic resistance of plants against nematodes (Tian et al. 2007; Lugtenberg and Kamilova 2009; Osman et al. 2011; Norabadia et al. 2014). The tested microorganisms can stimulate plant growth by using different mechanisms that include improvement of plant nutrition, production and regulation of phyto-hormones, and suppression of disease-causing organisms. In addition, these bacteria survive in soil around plants and can aggressively colonize plant roots and benefit plants by providing growth promotion materials (Tian et al. 2007; Lugtenberg and Kamilova 2009; Ali and Vidhale 2013). Also, Keneni et al. (2010) reported that Bacillus and Pseudomonas supply phosphate to plants. In the present study, although the highest average plant growth criteria increase was achieved by using B. pumilus (Bp1) followed by B. pumilus (Bp2), it is interesting to note that the moderate yield increases were recorded by these later isolates, respectively. On the other hand, the highest average percentage yield increase was achieved by using P. fluorescens (Pf1) followed by P. fluorescens (Pf2) in spite of their less average plant growth increases. P. fluorescens recorded intermediate nematode reduction in the present study, but the previous study by Khan and Haque (2011) proved that P. fluorescens achieved the greatest reduction in the studied nematode reproductive parameters and plant growth of tobacco which may be due to the differences in isolates. Akhtar et al. (2012) reported that there was significant increase in chlorophyll content which was observed in T7 which received a higher dose of bacteria (P. fluorescens (20 ml) + B. subtilis (20 ml) treatment compared to control. In the present study, B. pumilus (Bp1) recorded the highest total contents of photosynthetic pigments followed by P. fluorescens (Pf1) as single treatment for each. Formation of some phenolic compounds in seeds of resistant plants was involved in the mechanism of resistance against PPNs (Bajaj and Mahajan 1977; Giebel 1982). Resistance against nematodes has been affected by the performed phenol levels in roots of certain plant cultivars (Narayana and Reddy 1980). It is well known that rhizobacteria are the most abundant microorganisms in plant rhizosphere exhibiting different modes of action against nematodes. Also, these microorganisms can stimulate plant growth by using a variety of mechanisms as mentioned previously. The present results clarified that inoculation of cowpea plants with two isolates from each of the abovementioned microorganisms at an early stage of plant development can reduce population of root-knot nematode and improve biomass production through direct effects on root and shoot growth and nematode infection. Yet, before utilizing such bacteria for field application and commercialization as reported by Abd-Elgawad and Vagelas (2015), their experimentation under field conditions should be documented. It can be concluded that using some antagonistic plant growth-promoting rhizobacteria achieved efficient control of the root-knot nematode problem. These treatments not only lowered the pathogenic effect of the nematodes, but also stimulated plant growth and yield, while avoiding toxicity and hazardous nature of chemical nematicides in the environment. However, it is necessary to further affirm these results and investigate various mechanisms involved caused by the studied bacterial isolates under field conditions. This research work was supported in part by the In-house Project No. 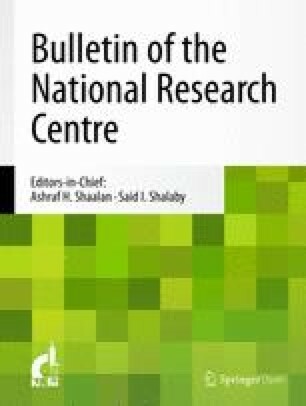 11030133 entitled “Pesticide alternatives against soil borne pathogens attacking legume cultivation in Egypt” funded by National Research Centre, Egypt. The tested bacterial isolates and nematodes are available in Egyptian environment and were identified in the laboratory. Abd-Elgawad MMM, Askary TH (2018) Fungal and bacterial nematicides in integrated nematode management strategies. Egypt J Biol Pest Cont 28(74). https://doi.org/10.1186/s41938-018-0080-x.